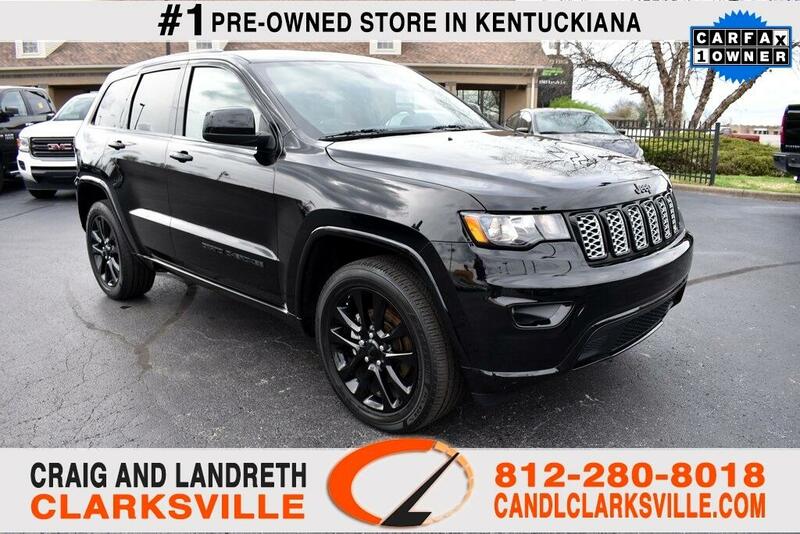 CERTIFIED BY CARFAX - ONE OWNER AND NO ACCIDENTS 2017 JEEP GRAND CHEROKEE ALTITUDE ** 4WD/4X4/AWD ** ONLY 18,000 MILES ** SUPER CLEAN CARFAX AND COMES WITH A GREAT PREVIOUS OWNER RECOMENDATION ** SUNROOF/MOONROOF ** TOW PACKAGE ** HEATED SEATS ** HEATED STEERING WHEEL ** BACKUP CAMERA ** COMES WITH BALANCE OF FACTORY WARRANTY REMAINING ** THIS IS A NON SMOKER VEHICLE ** REMOTE START ** THIS IS LIKE NEW AND DOESN'T NEED A THING IT REALLY IS FLAWLESS...... WHY PAY THE DIFFERENCE IF YOU CAN'T TELL THE DIFFERENCE?! WHY BUY NEW?! YOU WILL NOT BE DISAPPOINTED WITH ANYTHING ON THIS VEHICLE! ANY QUESTIONS CALL RICHARD SPAN, JAKE SMITH, OR JIMMY SMITH JR AT 812-280-8018!! WE'VE NEVER LOST A DEAL WHEN IT CAME TO PRICE OR QUALITY!! JEEP GRAND CHEROKEE HAS BEEN INSPECTED BY OUR SERVICE DEPARTMENT WHO COMPLETED A 110-POINT REVIEW TO ENSURE QUALITY AND DID ALL THE ROUTINE SERVICE. WE HAVE THE CLEANEST PRE-OWNED VEHICLES IN KENTUCKIANA! LET US SHOW YOU THE DIFFERENCE. Fresh oil change, White glove detailed, 110 point safety inspection, Bluetooth, USB, Heated Seats, Remote Start, Sunroof/Moonroof, Keyless Entry, Rear View Camera/ Backup Camera, Satellite Radio/ Sirius XM, Push Button Start, Leather Seats, 2nd Row Bench Seating, Parking Sensors, Parking Assist, Towing Package, 4WD, All Wheel Drive, Sport Package, Premium Audio, Premium Sound System, FULL FACTORY WARRANTY AND NEW CAR RATES APPLY TO THIS VEHICLE, Non-Smoker, WHY BUY NEW WHEN YOU CANT TELL THE DIFFERENCE, THIS CAR IS LIKE BUYING A NEW CAR BUT THOUSANDS LESS, Lots Of Options, Premium Wheels, S Line Package, S Line Sport Package, Tow Package, Trailer Package, HomeLink, Certified. Certified by CarFax., Heat Package, Remote Start Package, Special Edition Package, Graphics Package, 4WD, 115V Auxiliary Power Outlet, 180 Amp Alternator, 1-Year SiriusXM Radio Service, 6 Month Trial (Registration Required), 7 & 4 Pin Wiring Harness, 8.4" Touchscreen Display, Auto-Dimming Rear-View Mirror, Class IV Receiver Hitch, For Details Visit DriveUconnect.com, For More Info, Call 800-643-2112, Heavy-Duty Engine Cooling, Instrument Cluster w/Off-Road Disp. Pages, Power 4-Way Driver Lumbar Adjust, Power 8-Way Driver/Manual Passenger Seat, Power Liftgate, Quick Order Package 23Z Altitude, Radio: Uconnect 3C w/8.4" Display, Rear Load Leveling Suspension, Roadside Assistance & 9-1-1 Call, Security & Convenience Group, Security Alarm, SiriusXM Satellite Radio, Trailer Tow Group IV, Uconnect Access, Universal Garage Door Opener. Odometer is 798 miles below market average!